Vous pouvez également utiliser 12800 Kobo Super Points pour l'obtenir ! This is the first biography of Capt. Joe Rochefort, the Officer in Charge of Station Hypo the U.S. Navy’s decrypt unit at Pearl Harbor and his key role in breaking the Imperial Japanese Navy’s main code before the Battle of Midway. It brings together the disparate threads of Rochefort’s life and career, beginning with his enlistment in the Naval Reserve in 1918 at age 17 (dropping out of high school and adding a year to his age). It chronicles his earliest days as a mustang (an officer who has risen from the ranks), his fortuitous posting to Washington, where he headed the Navy’s codebreaking desk at age 25, then, in another unexpected twist, found himself assigned to Tokyo to learn Japanese. This biography records Rochefort’s surprising love-hate relationship with cryptanalysis, his joyful exit from the field, his love of sea duty, his adventure-filled years in the 30s as the right-hand man to the Commander in Chief, U.S. Fleet, and his reluctant return to codebreaking in mid-1941 when he was ordered to head the Navy’s decrypt unit at Pearl (Station Hypo). The book focuses on Rochefort’s inspiring leadership of Hypo, recording first his frustrating months in late 1941 searching for Yamamoto’s fleet, then capturing a guilt-ridden Rochefort in early 1942 mounting a redemptive effort to track that fleet after the Japanese attack at Pearl Harbor . It details his critical role in May 1942 when he and his team, against the bitter opposition of some top Navy brass, concluded Midway was Yamamoto’s invasion target, making possible a victory regarded by many as the turning point in the Pacific War. The account also tells the story of Rochefort’s ouster from Pearl, the result of the machinations of key officers in Washington, first to deny him the Distinguished Service Medal recommended by Admiral Nimitz, then to effect his removal as OIC of Hypo. The book reports his productive final years in the Navy when he supervises the building of a floating drydock on the West Coast, then, back in Washington, finds himself directing a planning body charged with doing spade work leading to the invasion of Japan. The Epilogue narrates the postwar effort waged by Rochefort’s Hypo colleagues to obtain for him the DSM denied in 1942-a drive that pays off in 1986 when President Reagan awards him the medal posthumously at a White House ceremony attended by his daughter and son. 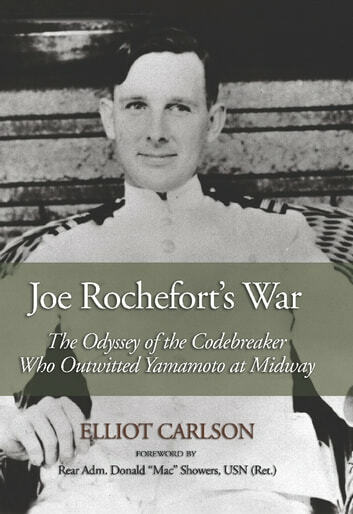 It also explores Rochefort’s legacy, primarily his pioneering role at Pearl in which, contrary to Washington’s wishes, he reported directly to Commander in Chief, US Fleet, providing actionable intelligence without any delays and enabling codebreaking to play the key role it did in the Battle of Midway. Ultimately, this book is aimed at bringing Joe Rochefort to life as the irreverent, fiercely independent and consequential officer that he was. It assumes his career can’t be understood without looking at his entire life. It seeks to capture the interplay of policy and personality, and the role played by politics and personal rifts at the highest levels of Navy power during a time of national crisis. This bio emerges as a history of the Navy’s intelligence culture. Captain Robert J. Bulkley Jr.